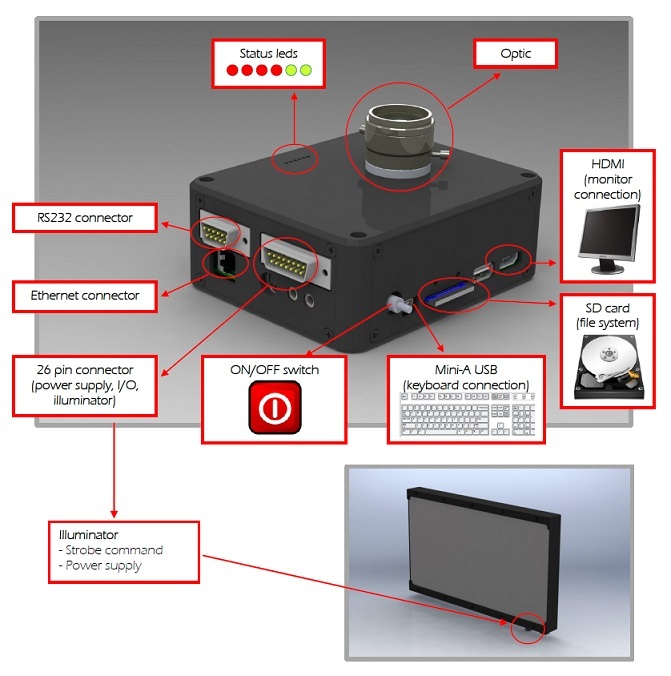 AceSmartCam is an intelligent camera (with the processor on board) designed and built by AceLabs, able to function without the aid of a PC (only necessary for the programming part). Features a dual core processor that integrates an ARM core (which runs a Linux operating system) and a DSP core (to which you can delegate more complex tasks from the computational point of view). The presence of the Linux operating system allows maximum versatility and compatibility of the system with the traditional enterprise networks (network AceSmartCam is seen as a device any Linux/UNIX). The possibility to connect a standard PC keyboard and a monitor with a digital input provide maximum interaction with the system and the real-time visualization of the results of inspections. This product is ideal for applications requiring a small footprint, low cost and a high level of customization. 3 led output to be configured according to requirements.